The Clinton camp surely fired that staffer after this kid botched the softball question he was supposed to lob up for Hillary. "Must be a Tang Telemarketer..."
These US Senators Are Living Like College Bros in a Frat House. Seriously. That's Iowa Republican State Representative Ross Paustian, enjoying what he claims was a "gag gift" while totally paying attention to his political duties. 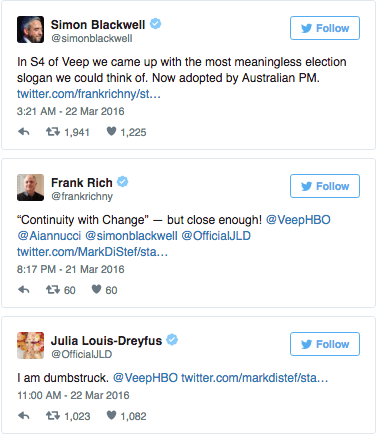 Australia's prime minister,Malcolm Turnbull, just came up with a new campaign premise that 'Veep' fans will be a little too familiar with. He talks about keeping continuity... but also changing, something that Julia Louise-Dreyfus's character on 'Veep' also promised. Actors and creators involved on the show, 'Veep', commented on how surprised they were that this turned into a real political talking point. Maybe they were too good at parodying politics? UPDATE: This was staged for laughs, spelling mistakes included. Yes, in case anyone out there is watching this video wondering to themselves what the hell the big deal is with these answers...it's this: they are the same damn thing. The Affordable Care Act, and Obamacare = The same. Could we at least have had one person answer correctly. Nah dawg, we gotta stir the pot of stress-ridden hysteria on a regular basis. These Voters Might Be Ready to Dump Trump and Pledge Support for... Hitler? Meet Julie Bishop, Minister for Foreign Affairs and human emoji. During an interview with Bishop on the Today show in Australia this week, host Karl Stefanovic brought up news that Governor-General Peter Cosgrove’s staff wanted a $2000 Thermomix for their kitchen. “I’m going to answer in emoji,” she said, going on to make a weird face. Well played. But which emoji was she impersonating? Oh Mittens, that's not how Venn Diagrams work! For the best politicLOL coverage of the Republican National Convention, visit Pundit Kitchen!